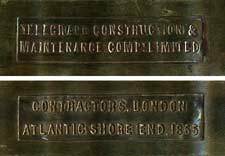 After the worldwide interest in the 1858 Atlantic cable (and despite its early failure), when it came time for the next attempt to span the Atlantic many companies wanted credit for their association with the project. Two such were Webster & Horsfall, and J & E Wright, both of Birmingham. 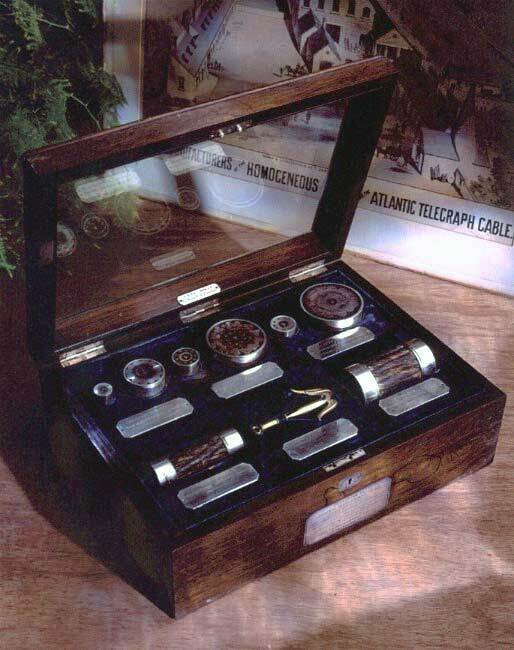 The 1865 cable was manufactured by the Telegraph Construction & Maintenance Company (Telcon) at Greenwich, London. The conductor was a strand of seven copper wires, No.18 BWG; the central wire was covered with Chatterton’s compound to fill any voids in the conductor, and this was coated with four layers of gutta percha to form the core of the cable. The core was then covered with tanned jute, and finally the assembly was armoured with ten homogeneous iron wires of No.13 BWG. The shore end had an additional armouring of twelve triple-stranded wires. The armouring wires were supplied by Webster & Horsfall of Hay Mills, Birmingham, a company of wire-drawers founded about 1720 and still in business today. The Hay Mills Foundation has recently been established to preserve and display the history of the site (website under construction). Having supplied the armouring wire for the 1860/61 Algiers-Toulon cable, and with James Horsfall keeping close contact with the cable manufacturers in London, in May of 1864 the company was awarded the contract for the armouring wire for the 1865 cable. The wire was drawn from Bessemer steel produced at the company’s own mill at Killamarsh, Derbyshire. Up to this point the total yearly output of steel at Killamarsh had been 400 tons. James Horsfall quoted a price of £45 per ton, £40 in cash and the rest in shares of the Atlantic Telegraph Company and the contract for the wire was signed on 9 May 1864. The firm was then committed to supplying 1,600 tons of .095 inch diameter crucible cast steel wire in fourteen months, which it did successfully. This was the largest single order the company had ever received, and remained so for the next hundred years. We have now over 2,200 nautical miles of cable completed, and expect to sail the last of June or early in July. All is going well. With love to your wife. 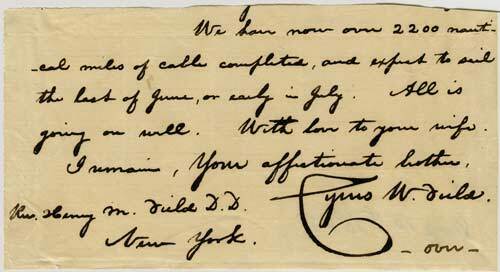 I remain, Your affectionate brother, Cyrus W. Field. 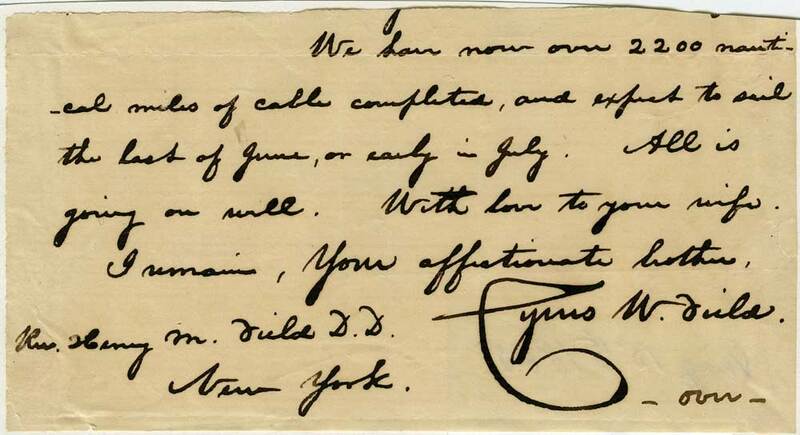 As this was such an important project for Cyrus Field, both personally and financially, it’s likely that he sent similar notes to a number of his correspondents back home in New York. 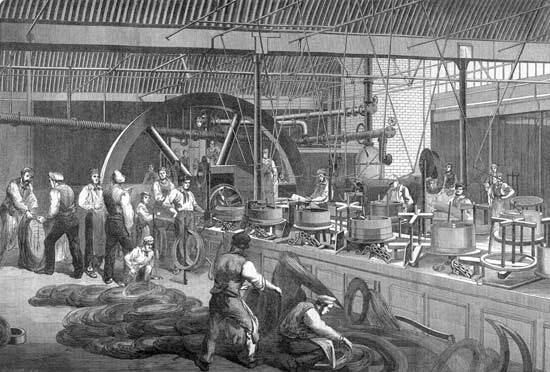 The Illustrated London News, in its issue of 15 September 1866, described the manufacture of the 1865 cable, which had just been recovered from the bed of the Atlantic by Great Eastern and completed. 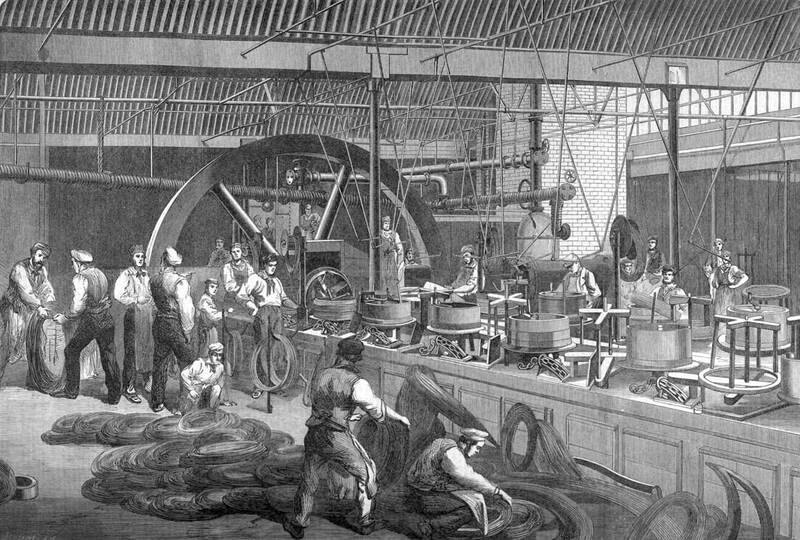 MANUFACTURE OF THE CABLE OF 1865. It will be remembered that the cable of last year, now so happily recovered from the depths of the Atlantic, was constructed by Messrs. Glass and Elliott, in their factory at Morden Wharf, East Greenwich, an account of which was given in our Paper at the time. The metallic wire, wound spirally around the cable to protect it from damage, had been manufactured at Birmingham, by Messrs. Webster and Horsfall, of Hay Mills. Our Illustration represents the interior of the large range of shopping, from seventy to eighty yards square, in which this work was executed. This building had been enlarged specially for the Atlantic cable contract. The Engraving shows the men at work, each superin­tending a drum on which the wire is coiled, as it is drawn down from one size to another. The process is a very simple one. The metal is received in rods, which are prepared at works belong­ing to the firm, situated at Killamarsh, near Sheffield. The end of a rod is pointed and then forced into what may be regarded as the circular eye of a large needle, or plate, as it is called. Being pulled through a certain distance by a pair of steam-driven pincers, it is attached to the drum, by the revolutions of which the whole rod is speedily drawn down from its original size to that of the aperture, gaining in length as it diminishes in gauge or diameter. Passing through successive stages of this process, but being annealed each time, to prevent its becoming brittle, it is gradually brought to the required degree of fineness. The cable-rods, each subjected to four drawings, have been thus extended from 60 yards, their original length, first to 150, next to 240, then to 330, and finally to 410, gaining on the average 95 yards by each operation. On being completed, the wire is exposed to a strain of 1000 pounds, and must be able to stretch half an inch in every 50 in. So well has the present manufacture borne this test, that, with very trifling exceptions, every section of the article has yielded as required under the pressure; and, on the force being removed, has returned to exactly its previous length. 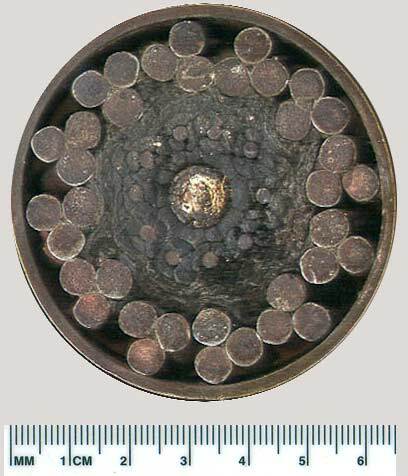 The wire made by Messrs. Webster and Horsfall, as here described, was used for binding round the core which contains the copper wire along which the electric current is transmitted. For the latter purpose seven lines of copper wire were employed. These being imbedded in Chatterton’s compound, afterwards encased in alternate layers of that material and gutta-percha and then padded with hemp saturated with a preservative compound, were bound together with ten strands of the homogeneous metal wire, each strand passing spirally around the whole. As the length of the cable was 2500 miles, it would have required 25,000 miles of the steel wire if each strand had been used in a straight line. As, however, they were applied spirally, the length was considerably increased. The total mileage drawn at Hay Mills was, in fact, about 30,000. ...there could have been no worse combination than the use of annealed and drawn wire, and its choice by the engineers of the time shews the inexperience with steel which then prevailed. The micro structure was wrong, and the wire was prone to breakages; furthermore any mishandling by the cable makers could have imparted additional and localised cod work of the wrong kind, which the wire would have been incapable of handling. The wire used was the company’s .095" un-patented crucible cast steel wire, which, as may be seen in the article on the loss of the cable cited above, had problems with brittleness. On several occasions while the cable was being paid out from the Great Eastern broken flakes of the armouring wire pierced the insulation; at first this was thought to be sabotage, but the cause was eventually found to be with the wire itself. The Bessemer process had been introduced some years previously - i.e. in 1855. That which comes under the description of homogeneous iron wire is drawn from charcoal puddled bars, often mixed with mild Bessemer steel. Messrs Webster and Horsfall (the famous pianoforte wire makers) were the originators of this class of iron wire, and this was the first occasion on which it was applied for submarine cables. It is advocated for homogeneous iron that it possesses almost the same strength as steel without the same springiness. In this instance, however, it was probably mixed with rather too much steel. The core of the new cable was precisely similar to that of the old one of the year before. The sheathing wires in this cable were galvanised (besides being of softer iron to start with), and again separately covered with five strands of Manilla yarn, which in this case were left untarred. The cable weighed 1 ton 11 cwt. per N.M. in air (5cwt. less than the 1865 cable), and 14¾ cwt. in water Its total diameter was 1.1 inch, and its breaking strain 8 tons 2 cwt., being thus a little higher than that of the previous cable, due, no doubt, to the general improvements in manufacture as regards the iron wire and the class of hemp used. The iron wire, besides being stronger, was also less hard and brittle—in fact more pliable. This wire was then galvanised by Richard Johnson & Nephew in Manchester. After the success of the 1866 expedition, and the recovery and completion of the 1865 cable, the difficulties with the wire of 1865 were forgotten. Webster & Horsfall received many accolades for their part in the enterprise, and the company was presented with a mahogany case containing mounted specimens of the 1858, 1865, and 1866 cables, together with a copy of W.H. Russell’s book on the 1865 expedition. 1858/65/66 cable sample case, still at Hay Mills. This arrangement of enveloping each iron wire in a separate protective serving, such as tended to advantageously reduce the specific gravity for recovery purposes, had already been covered in a patent (No. 2950 of 1856), taken out by Messrs John and Edwin Wright. This patent was really intended merely for ordinary ropes, the novelty consisting in the introduction of iron with a view to extra strength. The above species of cable was afterwards adopted for the Atlantic cables of 1865, 1866, and 1869, as well as in a few subsequent lines, since which it has been entirely abandoned, being found to involve decay to a much greater extent than where each wire abuts immediately against its neighbour. Sir,-In your description of the Atlantic telegraph cable on Friday last we find our names omitted. Will you, therefore, allow us to state through the medium of your columns that we are the inventors and patentees of the “external protection” of the cable, which combines the ten solid homogeneous wires, with the 50 manilla yarns, as described by you? 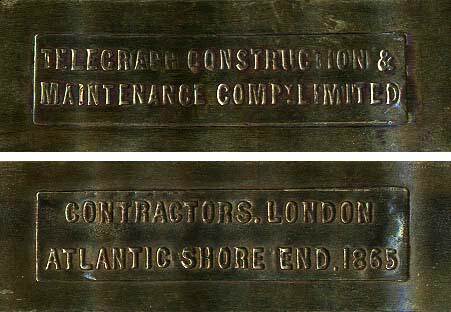 We may add we have granted to Messrs. Glass, Elliot, and Co. (now the Telegraph Constructing Company) a licence for the use of our patents in the manufacture of submarine telegraph cables. Universe Works, London and Birmingham. The Australian and New Zealand 1876, etc., etc. 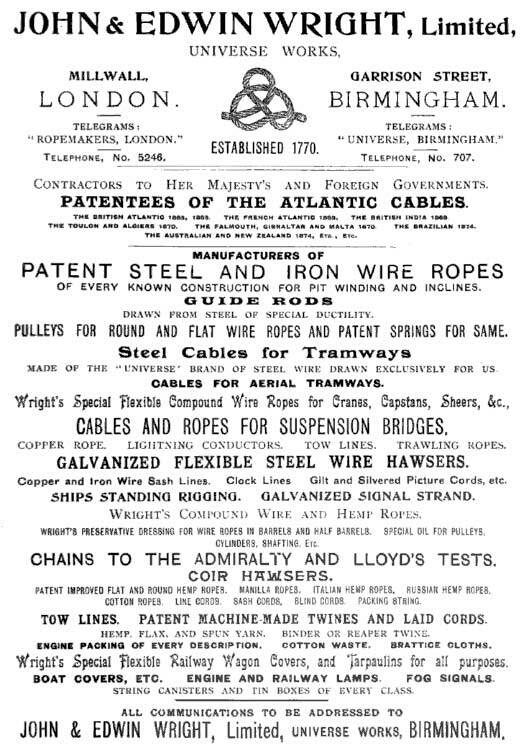 As late as 1931, and probably beyond, the company had the wording “Patentees of the Atlantic Cable 1864” on its letterhead. As Charles Bright notes above, the patent was for the method of armouring the cable, an unusual arrangement of wrapping each armouring wire in hemp fibre which resulted in a separation between the wires (see diagram above). This type of armouring was used on the 1865 and 1866 Atlantic cables, and for a small number of subsequent cables as late as 1876, and the method was then abandoned. The company had one earlier connection to the cable industry - it had made a 47" circumference coir (coconut fiber) rope used in the launch of the Great Eastern. In a strange coincidence, Hipkins was involved with another large ship - he died on the Titanic in 1912. The firm was later known as Wright’s Ropes, and was in business under that name until 1963, when it was taken over by British Ropes. In 1974 British Ropes became a subsidiary of Bridon Ltd., itself acquired in 1997 by FKI Plc (a British engineering conglomerate), and under the Bridon name the company is is still in business, tracing its history back almost 240 years as a rope manufacturer. 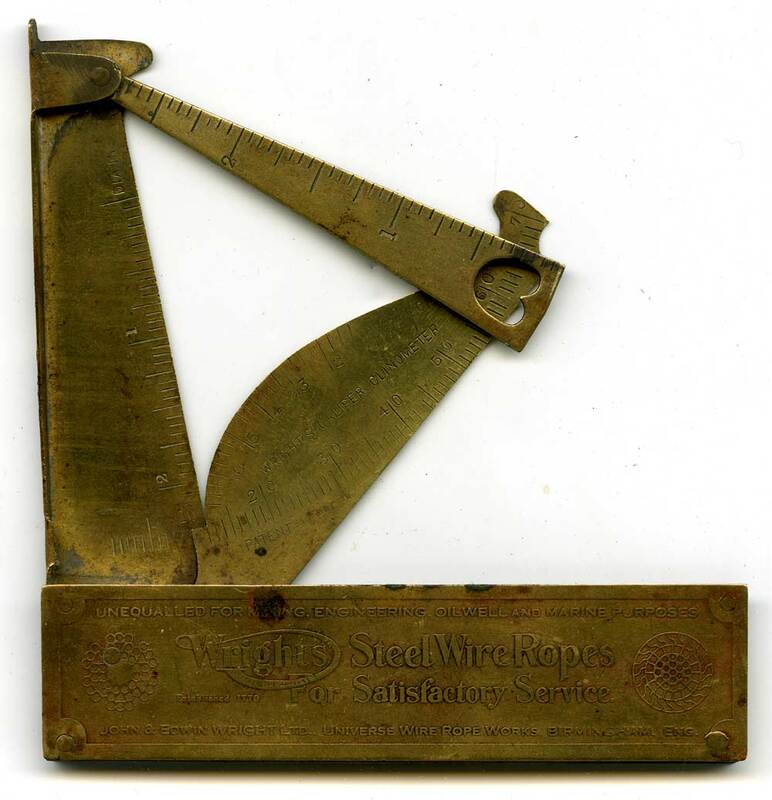 Over its long history J & E Wright produced a number of functional promotional items, including various gauges and other instruments. Some of these are shown here. Thanks to site visitor Margaret Richardson for her kind donation of this Wright’s caliper clinometer, found some years ago in Barnsley, Yorkshire. As Wright’s wire ropes were extensively used in the mining industry, it is not surprising to find an instrument like this in one of the most important areas of the South Yorkshire Coalfield. The three arms of the all-brass instrument fold out of its integral case, which measures just 4" x 1". One of the arms is stamped “Wright's Caliper Clinometer” and “Patent Appd. For.” From the patent record shown below, the instrument dates to 1920/21. John & Edwin Wright, Ltd., Universe Wire Rope Works, Birmingham, Eng. John & Edwin Wright, Ltd., of the Universe Works, Birmingham, send us their pocket instrument, called the “Caliper-Clinometer,” which is intended for the measurement of the inclination of ropes and their diameter, and for the inside measurement of the pulley grooves. 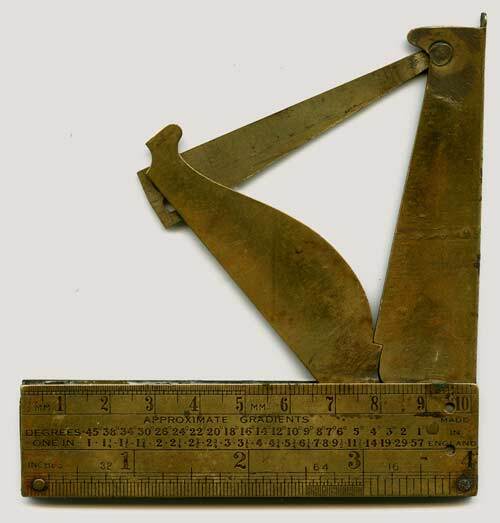 The object of the present invention is to provide a portable clinometer which is adapted to be folded readily into a small compass so as to be capable of being carried in the user's pocket, and which may be combined with or capable of being used as callipers and a depth gauge for measuring purposes, the appliance being particularly useful for mining engineers and the like for the purpose of measuring angles of incline, diameters of wire ropes, and depth of pulley grooves. The reverse of the case has both metric and imperial rulers, as well as a table of approximate gradients converting between Degrees and One In X measurements. Bright, Charles. Submarine Telegraphs, Their History, Construction and Working. London, 1898. Forestier-Walker, E.R. A History of the Wire Rope Industry of Great Britain. Federation of Wire Rope Manufacturers of Great Britain, 1952. Hipkins, W.E. The Wire Rope and its Applications. Birmingham, 1896. Horsfall, John. The Iron Masters of Penns. Kineton: The Roundwood Press, 1971.